2018 Health Insurance Sign Up Time Is Shorter, But Premiums Could Be Cheaper : Shots - Health News The silver (or gold) lining may be that changes in premium pricing may mean some people could sign up for a better health insurance plan that costs them less money. 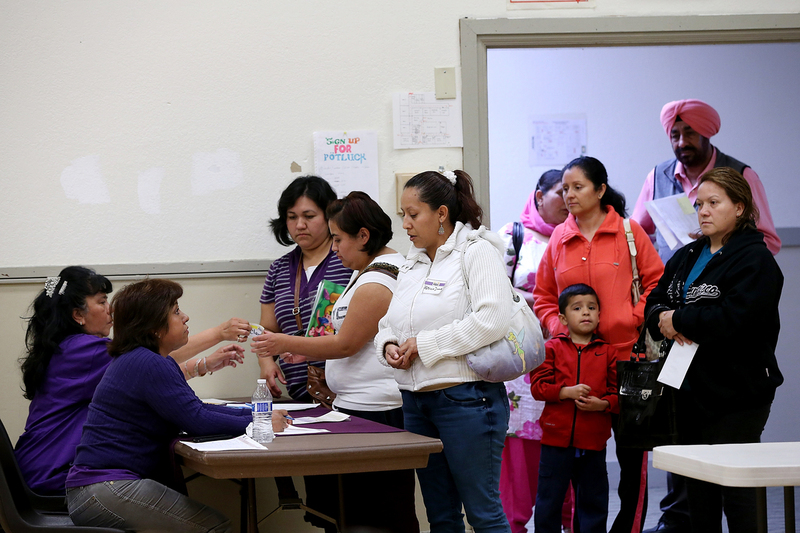 Lines like this one at a health insurance enrollment fair at the Ambrose Community Center in Bay Point, Calif., in 2014 may be longer this winter. For people who buy health insurance through the marketplace created by the Affordable Care Act, the 2018 open enrollment period begins in one week. But many consumers are confused about what to expect. No wonder. The Trump administration has slashed advertising and outreach about open enrollment, so concrete consumer information is sparse. But there's more than enough political rhetoric to make up for it, with regular partisan pronouncements that the marketplaces have collapsed and Obamacare is dead. Open enrollment in the 39 states using the federal marketplace starts Nov. 1 and continues until Dec. 15 for coverage that starts Jan. 1, 2018. That's considerably shorter than past years. (In some states that run their own insurance exchange, people can sign up through January for coverage.) If you miss the Dec. 15 deadline and your current plan won't be offered next year, you may get more time. More on that below. Despite the chaos, people who qualify for tax credits to help pay for their premiums or cost-sharing reduction subsidies to lower their deductibles and copayments will get them. And, in some cases, plans providing higher levels of coverage may be more affordable than less generous plans. There will be at least one insurer offering marketplace coverage in every sign-up area. Plans sold on the marketplaces will still offer comprehensive coverage and no one will be turned down or charged more because they have a preexisting medical condition. If you don't have insurance next year, you'll owe a fine unless you meet specific guidelines to be excused. Shopping for health insurance is about as entertaining as picking dryer lint off your clothes, but this year it's essential to sit down at your computer or work in person with a navigator (if you can find one; federal funding for these health insurance helpers has been trimmed, too,) and review the plans offered in your area. It's always important to check your plan details to see if the costs, benefits, or providers have changed, and compare them to other plans. This year, failing to do so could mean you'll miss out on significant opportunities to get more bang for your premium buck. Marketplace plans are grouped into four levels of coverage. Bronze plans pay 60 percent of covered medical expenses on average, silver plans pay 70 percent, gold picks up 80 percent, and platinum plans pay 90 percent. Because of a wrinkle in premium pricing this year, some consumers may be able to buy gold plans for a lower premium cost than that of a silver plan. For the same reason, consumers who buy a bronze plan may owe no premium at all. For lower-income consumers buying coverage on the marketplace, the health law provides two types of financial help. The federal government pays cost-sharing reduction (CSR) subsidies to insurers to shrink deductibles and copayments for people with incomes up to 250 percent of the federal poverty level (about $30,000 for one person), but only if they buy a silver plan. Also, people with incomes up to 400 percent of poverty (about $48,000 for an individual) can qualify for tax credits to help pay for premiums. The amount of the premium subsidy is based on both income and the cost of a low-priced silver plan. Earlier this month, President Trump cut off the federal cost-sharing reduction subsidies. While some members of Congress are proposing to restore them, the outlook is unclear. Recognizing that they might be on the hook financially if the administration cuts off payments, many insurers already incorporated the cost of those subsidies into their premiums for 2018 marketplace plans. Further, on their own or at the direction of state insurance regulators, many insurers limited those CSR price increases to the silver plans to which the premium subsidies are tied. But boosting silver premiums may also mean that consumers get larger premium tax credits. Even though premium tax credits are set according to a silver plan, they can be used for any plan. So shoppers who qualify for those subsidies may find that while silver plan premiums are relatively expensive this year, bronze and gold plans may be more affordable, thanks to consumers' larger premium tax credits. "Premiums for silver plans are higher, but not for gold or bronze," says Caroline Pearson, a senior vice president at Avalere Health, a consulting firm. "Premiums for gold and bronze plans are unusually cheap, so they might be a better value." In addition, people who don't qualify for subsidies may find better deals off the marketplace this year, depending on the state they live in. If you don't review your plan and update your income and other personal information, your insurer or the marketplace may automatically re-enroll you in your 2017 plan or another one that is similar in price and coverage. About two-thirds of people surveyed by the Kaiser Family Foundation earlier this fall said they would like to stick with the same plan if it's available. That may seem like a simple solution, but if premiums have changed, it could affect how much you owe, and a new plan may have different benefits or a different network of providers. You need to check out your options. If you live in a state that uses the federal marketplace, open enrollment ends Dec. 15, about six weeks earlier than last year. That reality, coupled with the fact that in-person help will be tougher to find, means that people should start looking into plans sooner rather than later. States that run their own marketplaces may allow consumers to enroll through the end of January. "Don't wait," says Sarah Lueck, a senior policy analyst at the Center on Budget and Policy Priorities. Her advice for consumers: "Go and look as soon as you can." However, some consumers who miss the Dec. 15 enrollment deadline may have another shot at signing up. If your current plan is being discontinued, you may qualify for a special enrollment period (SEP) because it's considered a loss of coverage, says Sandy Ahn, an associate research professor at Georgetown University's Center on Health Insurance Reforms. Consumers in that situation have 60 days after their coverage ends on Dec. 31 to enroll in a new plan. "If you didn't know that open enrollment was cut short this year, you might need that SEP," Ahn says. Consumers should hang on to their insurer letter that tells them they're losing their coverage under their current plan to document their eligibility. The Centers for Medicare & Medicaid Services didn't respond for a request for comment about the eligibility for a special enrollment period in these circumstances.